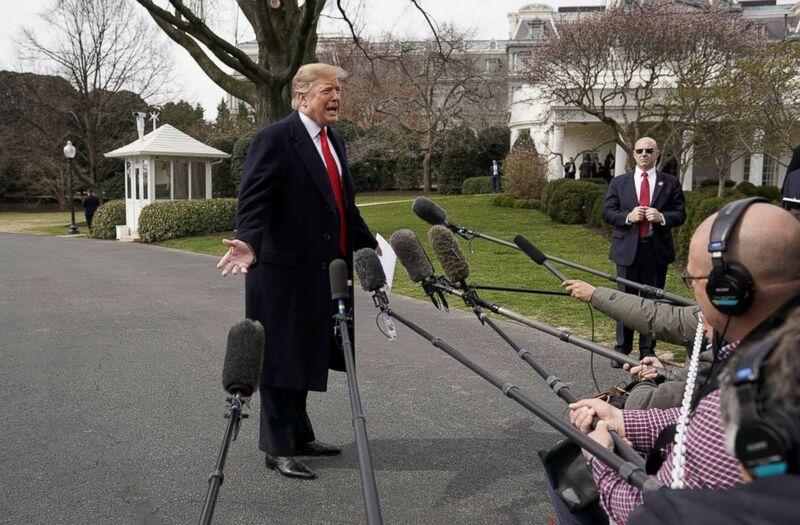 President Donald Trump said on Wednesday that he has no idea when special counsel Robert Mueller's report will be released but signaled he was open to letting the public see it. "We'll see what the report says -- let's see if it's fair. I have no idea when it's going to be released," Trump said of Mueller's report, expected soon as he's believed to be wrapping up his investigation. (Kevin Lamarque/Reuters) President Donald Trump talks to reporters as he departs on travel to Ohio from the White House, March 20, 2019. "Does the public have a right to see the Mueller report?" ABC News Chief White House Correspondent Jonathan Karl asked the president as he departed the White House for a trip to Ohio. "I don't mind. I mean frankly, I told the House if you want, let them see it," Trump said, apparently referring to House Republicans who, along with House Democrats last week, voted unanimously for a resolution supporting public release of Mueller's findings. The president's comments amounted to his clearest statement yet in favor of the report's release and come after he said in a tweet last week that there should not even be a Mueller report. 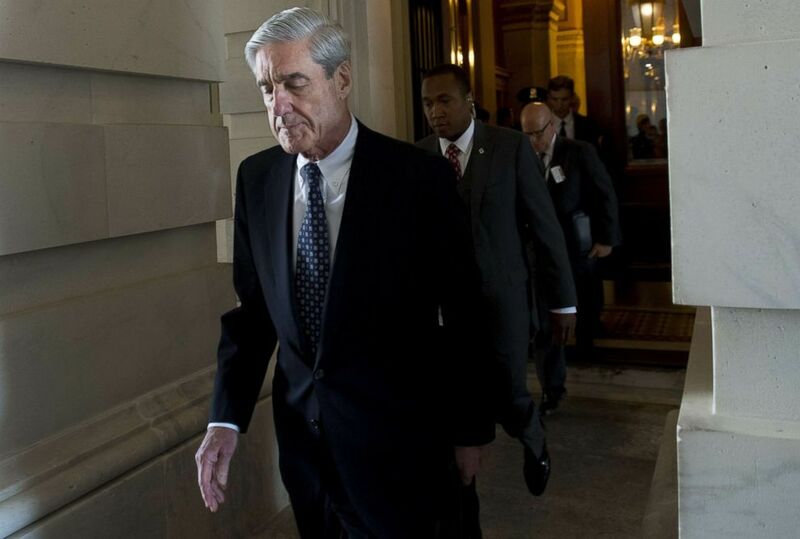 (Saul Loeb/AFP/Getty Images, FILE) Former FBI Director Robert Mueller, special counsel on the Russian investigation, leaves following a meeting with members of the US Senate Judiciary Committee at the US Capitol in Washington. The president repeatedly stressed a relatively new line of attack on Mueller's legitimacy, arguing that the initial premise for launching an investigation into whether his campaign colluded with Russia during the election was unfair given how he was elected. "I just won one of the greatest elections of all time in the history of this country and even you will admit that. And now I have somebody writing a report that never got a vote? It's called the Mueller report. So explain that, because I don't get it and my voters don't get it," Trump said. "But it's sort of interesting that a man out of the blue just writes a report." "Let it come out, let people see it. That's up to the attorney general ... and we'll see what happens," President Trump tells @jonkarl. He then voiced his support for the report's release but reiterated, as he has said previously, that if or how the report gets released is up to recently-installed Attorney General Bill Barr. "Now at the same time, let it come out, let people see it. That's up to the attorney general. We have a very good, highly-repected man and we'll see what happens, but it's sort of interesting that a man writes a report -- I had 306 electoral votes against 223 -- that's a tremendous victory," he said. "I got 63 million more, 63 million votes and now somebody just writes a report. I think it's ridiculous, but I want to see the report, and you know who wants to see it? The tens of millions of people that love the fact that we have the greatest economy we've ever had," Trump said. Asked if Mueller is a "bad actor" Trump replied, "I know that he put 13 highly conflicted and, you know, very angry, I called them angry Democrats in," referring to the special counsel's prosecutors. "So you know, I--so what it is--now, let's see whether or not it's legit. You know better than anybody there's no collusion. There was no collusion. There was no obstruction. There was no nothing. "But it's sort of an amazing thing that when you had a great victory, somebody comes in, does a report out of nowhere, tell me how that makes sense, who never got a vote, who the day before he was retained to become special counsel, I told him he would be working at the FBI," Trump said. "End of the following day, they get him for this. I don't think so. I don't--I don't think people get it. With all of that being said, I look forward to seeing the report."